The perfect loaf to have all Easter weekend long. Moist and luscious, this is the perfect lemon loaf to accompany a cup of afternoon tea, or end a meal with. It’s a special treat we sell at Kelly Bake Shoppe only during Easter time, that you can now make yourself at home! Be sure to let the loaf cool completely before you drizzle over the glaze. Otherwise, it will all be absorbed completely and you’ll miss out on the sweet-tart surprise. Preheat the oven to 350°F. Lightly grease a 9- by 5-inch loaf pan. Combine the flax meal and chia seeds with 6 tablespoons of water and set aside to thicken. In large mixing bowl, whisk the flour, sugar, Sucanat, baking powder, baking soda, xanthan gum, salt, and poppy seeds. In a medium bowl, combine the milk, flax and chia mixture, vanilla, lemon zest, 1 tablespoon of the lemon juice and the lemon extract. Add the wet ingredients to dry ingredients and mix well with a hand mixer. Gently fold in the melted butter. Scoop the batter into the prepared loaf pan. Bake for 50 minutes, rotate the loaf pan after 25 minutes of baking. Bake until golden brown and a tester inserted into the middle of the loaf comes out clean. Let the loaf cool completely in the pan before removing to a wire rack. Make the glaze: Mix the powdered sugar with the remaining 4 teaspoons of lemon juice. 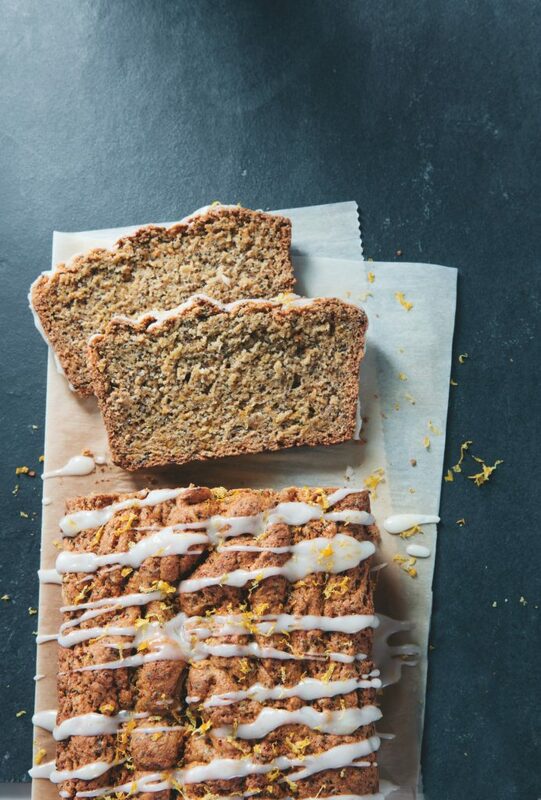 Use a small spoon to drizzle lemon glaze over the cooled lemon poppy seed loaf. Let the glaze soak in for a few minutes before serving.